Through all of their trials and tribulations (and assassinations and exiles, etc., etc. ), the Greeks really have done a remarkable job of keeping their hands on (or, rather, getting their hands back on) their tiaras. 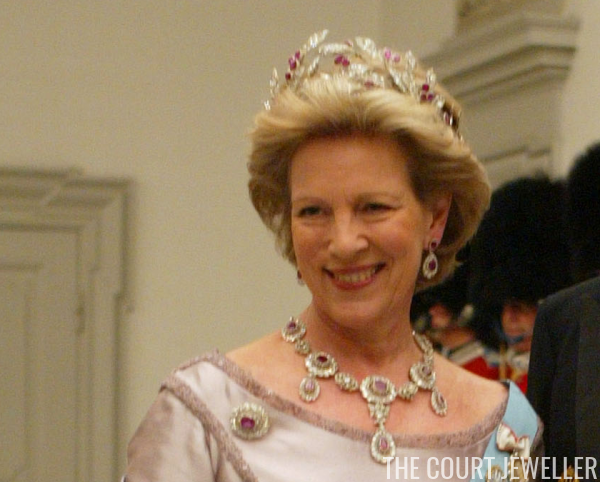 Today's tiara, the Ruby Olive Wreath Tiara, is an example of an heirloom piece that has been reunited with the former royal family and remains with them today. The olive wreath’s first royal wearer was Queen Olga, who was born a Russian grand duchess and became queen at the tender age of 16. The rubies in the tiara and the rest of the parure, which some think may have been sourced from her native Russia, are pigeon’s blood rubies, which sometimes look pinky-purple in certain lights. Apparently Olga's husband, King George I of the Hellenes, purchased the rubies and had them set in the parure for his wife. When Olga died in 1926, she left the rubies to her son, Prince Nicholas. His wife, Elena Vladimirovna of Russia (AKA the woman who sold the Vladimir tiara to Queen Mary), wore the ruby set in a portrait. They also loaned the tiara to their daughter, Princess Marina, Duchess of Kent, who wore it to the State Opening of Parliament in October 1937. 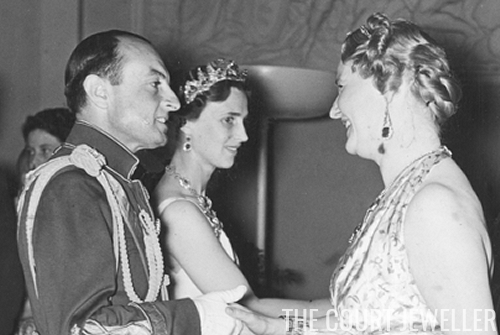 Nicholas’s daughter, Princess Olga of Yugoslavia, was the next lucky person to own the tiara; she inherited the sparkler from her father in 1938. She wore the ruby parure in a portrait; she also, unfortunately, wore it during a visit to Berlin in 1939. Olga had several other tiaras, from both her own family and from the family of her husband, and this tiara apparently wasn't one that she wore very often. The war years were not particularly kind to the Yugoslavian royals, who were exiled, and the tiara was sold. 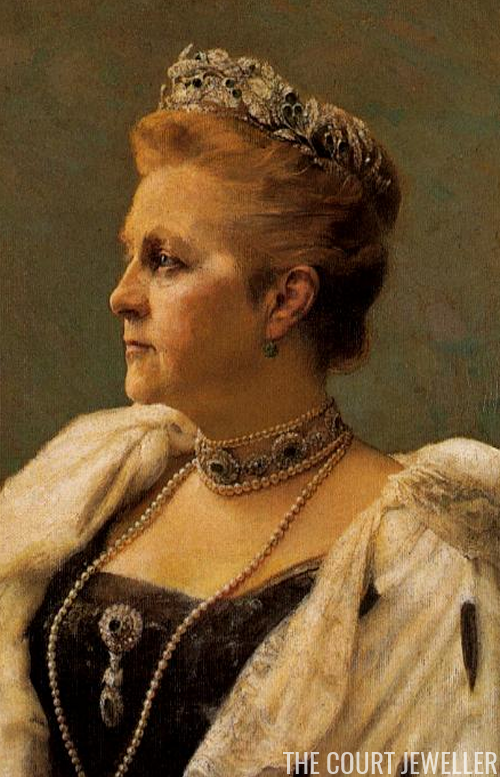 But this was a good tiara sale, because the buyer of the tiara was none other than King Paul of Greece, Olga’s cousin. His wife, Queen Friederike, put the olive wreath tiara to good use during her husband’s reign, and after his death, she passed it along to the new queen, Anne-Marie. Anne-Marie brought the tiara with her when the monarchy was deposed for a final time, and she still wears the tiara and the rest of the ruby parure in public today, along with many other pieces from the Greek royal collection. Note: This is an updated version of a previous post with new information and/or images.